All moved into the new home sweet home? 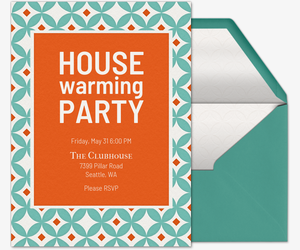 Break in the new place with a housewarming party -- and start by sending a free or Premium Evite invitation to your family, friends, and new neighbors. 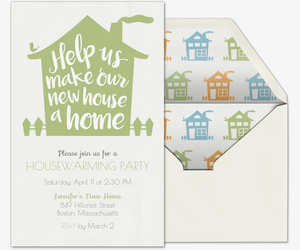 Our housewarming invitation collection features designs for all types of housewarming parties, from fancy dinner parties to more casual open houses. 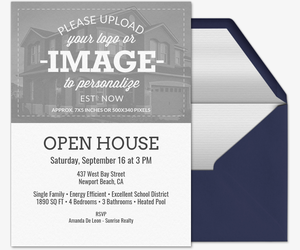 Give guests a warm welcome by personalizing our upload-your-own invitation templates with a photo of the housemates. 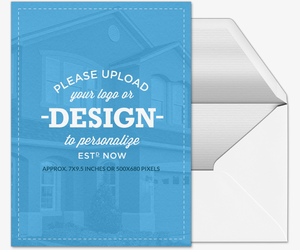 Once you’ve picked your favorite design, customize it with a personal host message. 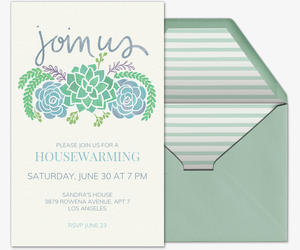 Paperless invitations make the planning process super simple. 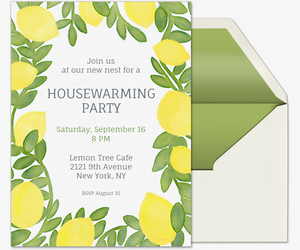 Track RSVPs, manage your guest list, send messages to guests, and share photos before, during, and after the event, all from your digital invitation page. Haven’t stocked up the fridge yet? Ask guests to bring contributions using our “What to Bring” list feature. Plus, spread the word about your party by sending your invitations custom, shareable link via text or by posting it on social media. 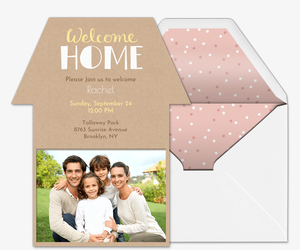 Our advertisement-free Premium invitations come with complementary envelopes and stamps, as well as the option to insert additional photo or text cards. Premium pricing is based on the number of invitations you send. 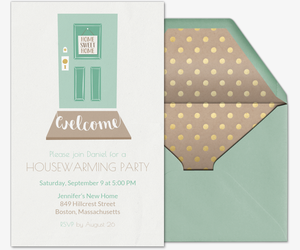 Make your friends feel right at home, too, with housewarming party tips from the pros at Evite Party Ideas. Check out our Housewarming Party Guide for pointers on everything from dishes to decor. Or, if you’re a guest of the party, take a look at our housewarming gift guide for all the best things the new residents need. Hosting another house party? Evite has invitations for every kind of occasion: dinner parties, cocktail parties, brunch, theme parties, BBQs, pool parties, and birthdays for all ages.